xo ♥ amela: Time Discovers Truth. It never ceases to amaze me how the truth always comes out. What you believe to be the truth could be a complete lie. Lies can only go so far until the truth eventually reveals itself. I absolutely believe that everything happens for a reason and I also believe that God sends us signs when we need it the most, we just have to be paying attention. When faced with a tough decision or needing guidance, there are signs everywhere. That house that you were looking to buy could have been bought by somebody else and the sign could be that it's not time to move... or God saying "this is not the house for you, I've got something better." That relationship you wanted to commit to could turn out to be the complete opposite of what you were hoping for when you hear the real truth about them from a friend at work. This is God's way of saying "This is not the one for you, I've got something better". Every path in life is a road to a new "pit stop", whether it be a new celebration or a new lesson. Lessons are often the difficult parts in life. Many times it can lead to a new life change or a new outlook on life. When learning the truth within time is when the greatest lesson of all is learned. You discover that person is not who they say they were and have a new view of who they are. Everything you once believed was a lie, whether it be the fact that they buy designer bags when they don't, or that they are cheating on their spouse when they say they aren't. You can't stop people from lying. 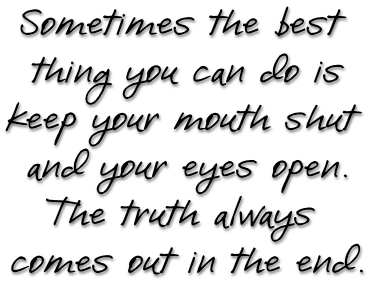 But you can give time to discover the truth because the truth always comes out.